The compact grinding and polishing automat SAPHIR X-Change from ATM is fully integrated into the System Lab 2.0. The SAPHIR X-Change combines several meters of standard equipment for grinding and polishing in a single unit, e. g. changer with stack for 16 grinding and polishing media, integrated dosing unit and settling tank. The process is automated, with intuitive touch-screen controls. Easy manual loosening and tightening of sample holder for central pressure streamlines the preparation process. 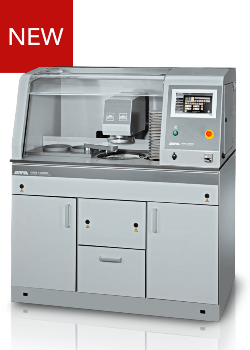 Grinding or polishing media is automatically modified and all parameters can be adapted directly during the process. The semi-covered working space with large panel and light-barrier provides a high safety standard.